Questions about knowledge often arise in dialogues I have with friends. Yesterday I found myself involved in one such dialogue. Our examination began by trying to establish, with a level of certainty, what we could know about the room we were occupying. As our discussion progressed, we considered the question of knowledge from the point of view of other creatures. What, for example, can an insect know with certainty about the world? 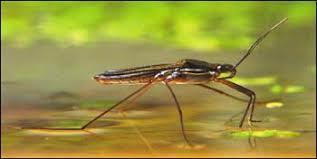 The water bug is an insect that can walk on water. From his point of view, water is a solid object that can be walked upon. But from our point of view, water is not solid. We sink in water. The bug's senses tell him water is solid and he constructs a story of reality based on this information. But surely we humans can know more about the world than a bug. Surely our senses are more accurate. Perhaps not. I asked my friend to consider the table we were sitting next to. I suggested that we could both walk on it because it is solid. We could certainly sit on it. But, I asked, are my senses telling me about how the table really is? Or am I like the water bug, merely creating a story about the world that fits the way it appears to me? What exactly is the table? My wise friend has knowledge of the science you moderns call "physics". He explained that the table is comprised of many trillions of atoms. It seems my predecessors, the "atomists" were correct. He went on to explain that atoms have, as part of their constitution, a cloud of electrons, which have a negative charge, which means they cannot be pushed together. The point that emerged from our discussion is that the electrons in my hand repel against the electrons in the table. That is why I cannot push my hand through the table. That is why the table "feels" solid. In actual fact, the atoms that comprise my hand do not actually touch the atoms that make up the table. So, my friends, it seems that we are like the poor little water bug. We create a view of reality that fits what our senses tell us, but this view does not exactly match how things really are in the world beyond our minds. After having come to this realization, we discussed optical illusions, hallucinations, and cognitive peculiarities such as change blindness. Each of these phenomena give us reason to believe that our senses can fool us into either thinking that something is there when it isn't, or that something isn't there when it is. An argument emerged from our discussion. This argument lead us quickly to a deduction about whether our senses can give us knowledge. And at this point our discussion came to an end, both of us uncertain about what, if anything, we can know about the world.